As a former marine mechanic and electrician, and now a consultant who carries out dozens of vessel inspections and sea trials every year, I can’t imagine life without an infrared pyrometer (IRP). This tool is so valuable to me that I keep two in my traveling tool bag. An IR gun enables users to identify anomalies or changes in temperature for various components, which can signal an impending failure. IRPs can perform a nearly limitless variety of tasks and troubleshooting operations. For a vessel operator, an IRP can establish a baseline for any component or piece of gear, from alternator bearings and belts to stuffing boxes and exhaust hoses. For instance, if you measure the oil pan on an engine while under way and it usually reads 190°F (88°C), you may be concerned if under the same operating conditions the temperature reads 220°F (105°C). Since both are within the “normal” range for most engines, you’d have no way of knowing something was wrong unless you’d kept a record of previous readings. For professionals, the more readings you take, the more your knowledge base grows. After you’ve measured 100 oil pans under similar operating conditions, the one whose temperature falls outside what you are accustomed to seeing, whether or not it’s within an acceptable range, should get your attention. Stuffing boxes provide an example of the pyrometer’s quick and easy measurement abilities. Typically, conventional stuffing boxes with waxed-flax packing operate at no more than 40°F (22°C) above seawater temperature. Dripless boxes often run somewhat cooler. 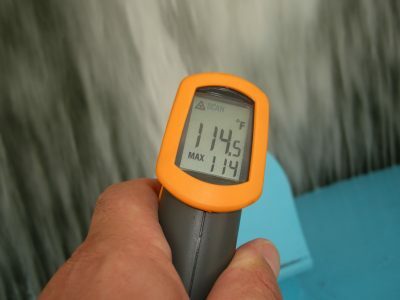 Thus, if the water temperature is 65°F (18°C), the stuffing box should be no hotter than about 105°F (40°C). Oil temperature is load dependent and has a sweet spot: too low and it leads to sludge and varnish production, too high and it accelerates oxidation. Without an infrared pyrometer this is difficult to measure. An IR pyrometer will detect problems when there are no visible clues. 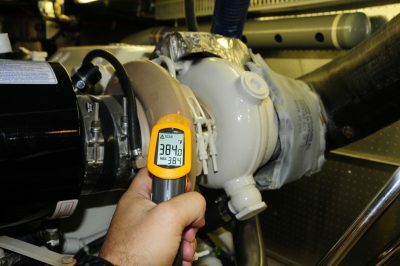 For example, during an alternator installation on a small cruising vessel, I ran my pyrometer over various parts of the engine, and the temperature of the alternator seemed unusually high, over 250°F (121°C) after just 15 minutes of run time. Upon closer inspection I discovered that the alternator was equipped with a unidirectional fan designed for rotation in the opposite direction it was turning; i.e., it was designed for a right-hand-rotation gasoline-powered engine. As a result, instead of drawing cool air through the alternator and expelling it at the fan, the fan was now attempting, and failing, to draw air in and push it through the alternator’s body, causing it to overheat. Even properly specified and installed alternators benefit from the regular attention of a pyrometer. Establishing a trend for the temperature of the body as well as the diodes and bearing carrier of the alternator will often call attention to an impending failure. Include the temperature of the pulley and the belt in your measurements. The change in temperature for water entering and leaving the engine is relatively small, usually between 10° and 25°, despite the high volume of water being pumped (it’s not unusual for a 400-hp engine to pump over 70 gpm/265 lpm at cruising rpm). If the water leaving the heat exchanger or entering the wet exhaust is significantly hotter than this differential, then something is probably wrong. The engine may not be overheating, yet; it’s likely that the flow rate is diminished because of a partially restricted intake, an occluded heat exchanger or exhaust elbow, or a damaged impeller. 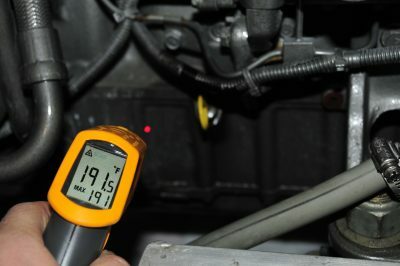 To identify this impending failure with an IR pyrometer, measure the temperature of the raw water as it enters the engine—typically at the hose where it enters the heat exchanger—and again where it leaves the heat exchanger or where it enters the exhaust elbow, taking measurements on the hose. The heat of the engineroom will have an effect on these temperatures; however, the temperature difference rather than the absolute temperature is the issue. While IR guns can deliver erroneous readings from highly reflective surfaces such as chrome, they are able to provide reasonably accurate readings for liquids. Yet another area worth attention is the exhaust system. It’s not uncommon for vessels to suffer from an overheating exhaust system while the engine operates well within the normal range. The temperature of the dry exhaust gas of a heavily loaded diesel engine can be as high as 800°F–1,000°F (425°C–535°C). Thus, any sections of the dry exhaust that are not water cooled or jacketed must be well insulated to ensure that no exposed portion exceeds 200°F (93°C). The test using a pyrometer should be conducted carefully after the vessel has operated at heavy load, approximately 90%, for a minimum of 15 minutes. Also check the wet portion of the exhaust. Typically, a properly functioning wet-exhaust-system hose operates at somewhere between 90°F and 140°F (32°C and 60°C). In my experience, any temperature exceeding 200°F indicates a problem. Measure the bulk of the hose section with the pyrometer from, and especially immediately after, the injected elbow to the muffler. Tests should be conducted after the vessel has run at cruising speed (approximately 75% load) for 15 minutes, and then descending from wide-open throttle at 200 rpm intervals, dwelling at each rpm stop for a minimum of five minutes, down through idle speed. Interestingly, higher temperatures are often recorded at lower rpm, when less water is being pumped, so be especially vigilant at these lower speeds. 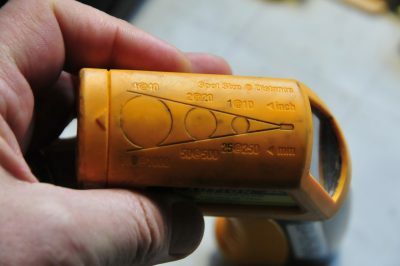 The infrared pyrometer’s sensing footprint is cone-shaped; the farther the gun is from the object being measured, the larger the measuring area. While IRPs are invaluable, they are not foolproof. Because they rely on shifting wavelengths of light for calculating temperature, they can deliver erroneous readings when measuring highly reflective surfaces such as stainless steel, aluminum, and chrome. Flat, black surfaces are ideal, though black tape or flat-black paint can be applied to better measure reflective surfaces. Additionally, the measurement footprint of an IRP is not, contrary to popular belief, the minuscule aiming laser dot. Instead, it is a cone that grows as the distance between the IRP and the surface increases, averaging everything within that circle (a cone calculation diagram is printed on every IRP I’ve owned). Therefore, it’s best to get your IRP as close as possible to the surface being measured, even touching it if it’s not too hot. Today, for the cost, it’s tough to justify not owning an IRP, or two.